Considering how many places I went looking for a Flash themed snack cake, it is obvious that I’ll go pretty far out of my way for a piece of Flash merchandise. I don’t buy everything I see though and that’s what we’re talking about today. We aren’t talking about the things I’d like to buy but can’t afford. There was a really nice statue out this month, but it wasn’t in the budget. Hopefully I’ll be able to track it down when things are better. So what won’t I buy? Hit the link to check it out. I skip a lot of figures. 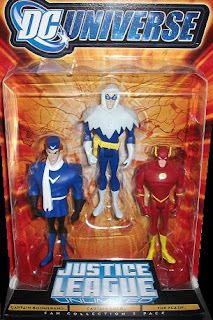 There are a whole lot of types of figures out there DC Direct, DC Universe Classics, DC Infinite Heroes, etc… I have one good DC Direct version of most the Flash Family Characters. Once I have that character I don’t usually buy him again unless the sculpt would be an improvement. I broke down and got the Universe version of Barry, Wally, and Cold. But there are a ton of figures out there and I don’t want a shelf with 20 versions of Barry if they all look the same. Usually for a figure it has to be something different. I’ll pick up the Mego homages when they come out. First good figure of Wally’s new costume will be a pick up too. 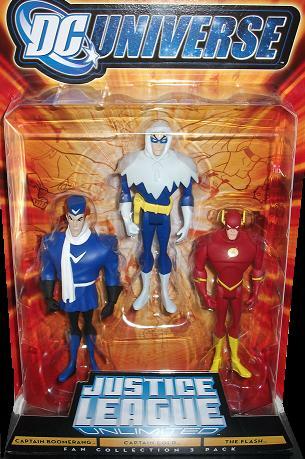 Despite loving that 3 pack with Cold, I never got started on the JLU line since I had the Flash maquette. Baseball caps. This has nothing to do with the quality though. I just can’t get comfortable in a baseball cap. I thought it might be because I shave my head, but I didn’t wear there when I had hair. There are some nice ones out there but I know if I buy it, I’d put it on once, decide it wasn’t comfortable, and then leave it on a shelf. 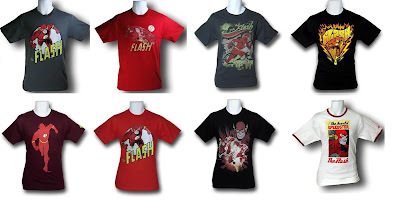 Shirts with the Flash on it. This one is strange. At this moment in my closet there are at least seven different shirts with some variation of the Flash symbol on them. But I can’t get into shirts with the actual character on them. I can’t even think of a logical reason why. It can’t be I’m that embarrassed; I’ve out on a historically accurate Viking helmet just to go out drinking before. For some reason.the one where it only shows the silhouette is really tempting me even though I know I probably wouldn't wear it. No. Thank you, but no. i agree with you, mostly. though i do have one shirt with Barry on it. However the one thing i'm dying for - is a Flash Mug. i have a batman and superman one. but an all red mug, with just a simple flash symbol on it (i think there's one in wally's room in Flash #0)..
i just wish DC Direct would make one. Miguel, your mug idea would be an instant purchase. The underwear isn't that bad! I actually own that pair of underwear (along with the yellow pair with the Flash symbols all over it. Walmart 2-pack, $7, a steal), but since I'm a lady, they fit kind of funny on me, so I can't wear them often. ToG: That is awesome. 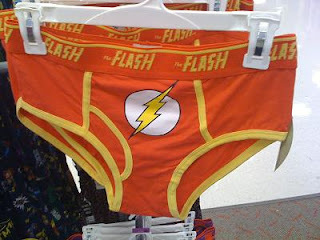 Had they been boxers, I would have gotten them. Pajama pants or shorts, instant buy. That is just not a cut of underwear I'm comfortable in.